Don Thorsen is a Wesleyan, and there’s never any doubt about where his allegiances lie in his new book, Calvin vs. Wesley: Bringing Belief in Line with Practice (Nashville: Abingdon, 2013). From the first page to the last, though, his tone is irenic and he approaches his task with admirable humility and graciousness. 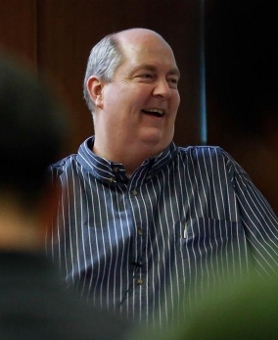 He doesn’t favor Wesley by bashing Calvin, but rather allows them their own voices while demonstrating their significant points of agreement and crucial areas of difference. The result is a useful, non-technical study suitable for anyone with questions about the relationship between these two venerable traditions, or who wonders about such contemporary theological fault lines as predestination, free will, or the authority of Scripture. Calvinism emphasizes Total Depravity, whereas Wesleyanism emphasizes that All are sinful. Calvinism emphasizes Unconditional election, whereas Wesleyanism emphasizes Conditional election. Calvinism emphasizes Limited atonement, whereas Wesleyanism emphasizes Unlimited atonement. Calvinism emphasizes Irresistable grace, whereas Wesleyanism emphasizes Resistable grace. Calvinism emphasizes Perseverance of the saints, whereas Wesleyanism emphasizes Assurance of salvation. 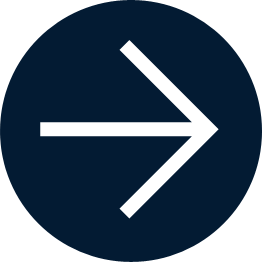 Drawing attention to the highlighted letters in each description, Thorsen thus represents the acronym associated with Calvin, TULIP, and introduces a companion acronym for Wesley, ACURA. Focusing on these differences, we might easily overlook the degree to which Thorsen finds common ground between Wesley and Calvin. As his chapter titles suggest, what typically separates them are questions of emphasis and nuance. Of course, matters of emphasis are often critical for the one tradition or the other, but our recognition of Wesley’s attention, say, to God’s grace should not mask the reality that Calvin likewise emphasized God’s grace. This is true even if they understood grace differently, a difference Thorsen captures in his chapter title “Grace: More Prevenient Than Irresistable.” Whereas Calvin took divine grace to be effectual (“that is, people cannot resist God’s work in their lives for their justification, sanctification, and glorification”), Wesley spoke of “prevenient grace,” which “enables people freedom to choose justification, sanctification, and other matters in life” (122). Thorsen reflects similarly on a range of theological loci: the nature of God, the role of Scripture, portraits of humanity, the meaning of salvation, the character of spirituality, the nature of the church, and the character of ministry. Although he devotes significant attention to articulating Calvin’s and Wesley’s views on these matters, and to comparing their thought on each point, the overall thesis of the book presses for a decision in favor of Wesley. This is due in part to his claim that many Christians who claim to follow Calvin actually live out a Wesleyan faith. It’s also due to the care with which Thorsen shows the biblical character and practical vitality of Wesley’s thought. 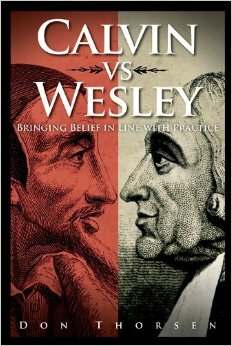 Calvin vs. Wesley is a timely book that deserves a wide readership. It brings its readers into conversation with Calvin’s and Wesley’s writings (rather than the writings of today’s Calvinists, Calvinians, and Wesleyans). It provides Wesleyans with solid instruction in their own evangelical faith. And it does both in a conversational tone that’s easy to read. Discussion questions at the end of each chapter make the book even more useful for teachers and students.